Mr. Abram Blumberg was a very successful business man, town promoter and builder. His wife, who was quite sickly, had spent a considerable amount of time reading about California in the books written by the notable author; Charles Nordhoff, and encouraged her husband to give up his business affairs and leave Iowa to seek a better climate in the west. They traveled first to the town of Los Angeles in 1872, but still Mrs. Blumberg’s health did not improve. After traveling around California, looking for a place where the weather might help her, they happened to read of a new town being promoted by a Mr. R.G. Surdam, in the Ojai Valley. The Blumberg’s arrival in the valley did much to help settle Mr. Surdam’s town. They arrived in 1873 and almost instantly, Mrs. Blumberg began to recover from her illness. 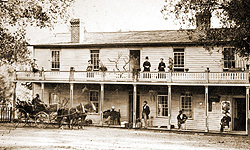 Deciding to stay, Mr. Surdam offered Abram Blumberg 20 acres in the center of town on which to build a small hotel, it was completed in 1874 and called the Ojai Inn, however most of the valley habitants referred to it as the Blumberg’s Hotel. The Ventura newspaper printed glowing reports on the progress in the valley; “No time should be lost by the Ojai people in making their little valley as attractive as possible. It can be made a most delightful resort.” January 1874. However, the town did not have a name, some were favoring the name “Topa Topa”, but Mrs. Blumberg felt that because of the wonderful books written by Charles Nordhoff, which was responsible for so many of the valley’s first settlers, they should name the town Nordhoff in his honor. Meanwhile, in the hotel, the first child was born in the new town of Nordhoff. Irene May Blumberg on September 29, 1874. Abram Blumberg was killed on the streets of Los Angeles while bicycle riding with his wife, hit by a Trolley Car in 1898.